The common vampire bat (Desmodus rotundus), which is distributed across most of the Neotropical region, is a reservoir of the rabies virus. In Uruguay, there have been recent reports of paralytic rabies in cattle transmitted by the common vampire bat. We sequenced the cytochrome b gene of five bats from northern Uruguay. All five DNA sequences were identical and grouped with a southern Atlantic Forest clade, suggesting recent dispersal from nearby Brazil, as revealed in phylogeographic diffusion analysis. CAMARGO, Arley et al. GENETIC RELATEDNESS OF Desmodus rotundus FROM NORTHERN URUGUAY WITH POPULATIONS FROM THE REMAINDER OF ITS DISTRIBUTION RANGE. Boletín de la Sociedad Zoológica del Uruguay, [S.l. ], v. 27, n. 1, p. 14-18, aug. 2018. ISSN 2393-6940. 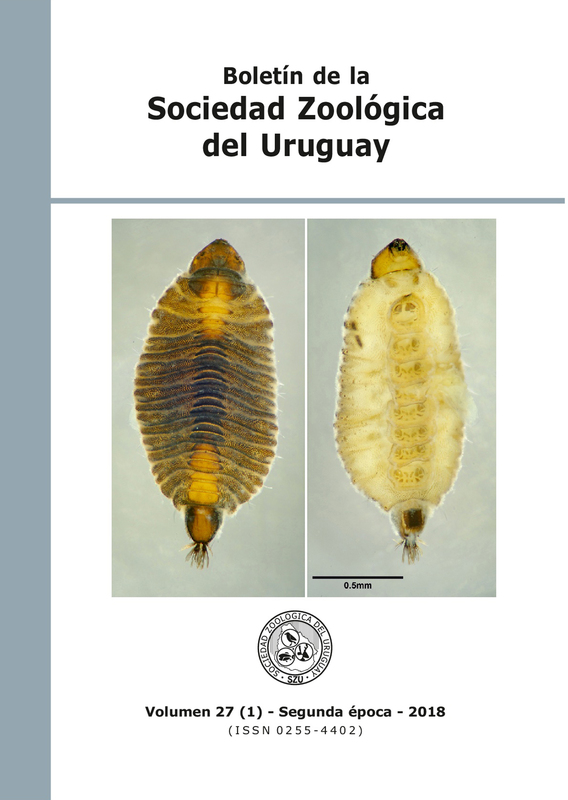 Available at: <http://szu.org.uy/journal/index.php/Bol_SZU/article/view/44>. Date accessed: 25 apr. 2019. doi: https://doi.org/10.26462/27.1.5.